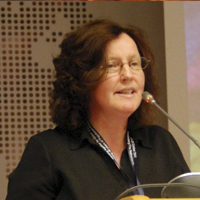 Dr. Ethna Regan is Head of the School of Theology in Mater Dei Institute, Dublin City University. She previously taught ethics and theology at the University of the West Indies, Trinidad, where she lived for over a decade. A Holy Faith Sister, she worked with their Trinidadian non-governmental association, Credo Foundation for Justice, in a centre for socially displaced children and in the campaign against the death penalty in the Caribbean. She also taught for five years in Samoa in the Pacific Islands. She studied at Mater Dei Institute, Fordham University, and holds a Ph.D. from the University of Cambridge. She has published in the areas of Christian social ethics, liberation theology and theological anthropology, and is the author of Theology and the Boundary Discourse of Human Rights (Georgetown University Press, 2010) which won a 2011 Catholic Press Association Book Award. A native of Dublin, she has family roots in Roscommon.